These tasty Maine-style biscuits are extra-tall and fluffy, and don't require buttermilk. Our thanks to the Bakewell Cream folks of Hampden, Maine for this recipe. Preheat the oven to 475°F. Lightly grease a baking sheet, or line with parchment. Work in the butter till the mixture is crumbly; some larger, pea-sized pieces of butter may remain intact. Add the milk, stirring till everything is moistened. Turn the dough out onto a clean work surface (a silicone mat works well), and fold it over once or twice. Pat it into a ¾"-thick square, rectangle, or circle. Cut the biscuits with a round or square cutter. Place them on the prepared baking sheet. Brush their tops with milk or melted butter, if desired. Bake for 5 minutes, then turn off the oven. Leave in the oven for an additional 5 to 10 minutes, till they're golden brown. Remove from the oven, and serve warm with butter and honey, jam, or gravy. Yield: about 1 ½ dozen big (2 1/2") biscuits, or about 32 smaller (1 1/2") biscuits. Shape biscuit dough ahead, freeze, and enjoy hot biscuits FAST. 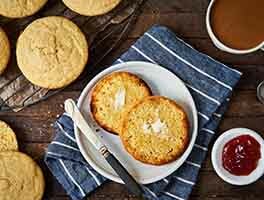 Simply place unbaked biscuits on a baking sheet, and freeze till solid. Wrap airtight in a bag. 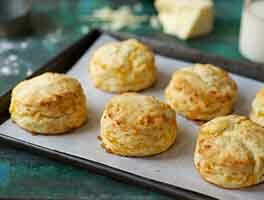 When ready to serve, preheat your oven to 475°F, and bake biscuits for 8 minutes. Turn the heat off, and leave in the oven for another 5 to 8 minutes, till they're golden brown. How about some tasty variations? 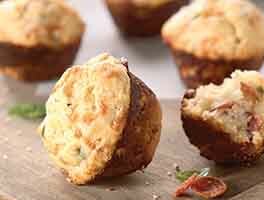 For cheese biscuits, toss 1 cup diced sharp cheddar cheese with the dry ingredients and butter, just before adding the milk. For chocolate chip biscuits, same deal: toss 1 cup chocolate chips with the flour/butter mixture just before adding the milk. Bake as directed at right. Chocolate chip biscuits may also be sprinkled with coarse white sparkling sugar just before baking. I adore these biscuits! The recipe is perfect as is. Sometimes, I like to change up some of the butter for shortening (the original Bakewell recipe) and I always add a teaspoon or so of sugar and an additional 1/2 tsp of salt--it makes the biscuits taste even better! I agree with some of the other reviewers that brushing melted butter on top sends this recipe to the moon. And making a batch, cutting and freezing the unbaked biscuits means that you'll always have homemade biscuits minutes away--and who wouldn't love that? I've been baking this recipe off the back of the bakewell cream can for many years. Their original recipe uses shortening instead of butter, which I find makes an even lighter biscuit. If you brush the just finished biscuits with melted butter you don't loose any of the flavor. I also use a bit more milk as I live at a higher altitude. 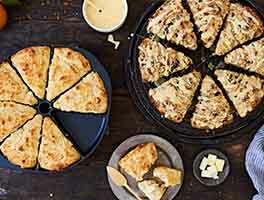 The technique of folding the dough together with your non-stick baking mat MAKES these biscuits. Mine were the tallest biscuits I have ever made. I didn't have the Bakewell Cream, so I used just the baking powder and it worked marvelously. One tip is to make sure you get all your biscuits in the oven in one batch because otherwise you have to turn the oven off for the first tray and then turn it back on again for the next tray. I made 1 1/2" biscuits so I had the oven on for 5 minutes and then off for 5 or 6 minutes. Our family has used this recipe for generations. If you are getting a bitter aftertaste, you are not mixing the Bakewell and baking Soda in enough. Mix it with a pastry blender or your hands prior to adding the milk. I agree with other reviewers: the bitter aftertaste from the Bakewell Cream takes away from the gloriousness of these biscuits. They did come out beautifully, tall & light. Tasted good while eating - but the burning aftertaste isn't worth it. I'll go back to my usual leavening agents. Sad - because I have a whole can of Bakewell! 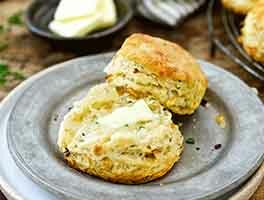 I have been looking for the perfect biscuit recipe for 20 years and have a variety of recipes that are good contenders, but I needed something that was both quick to make and delicious. I thought this was it. I bought a can of Bakewell Cream online and couldn't wait to try it. The first time, I noticed the biscuits tasted of baking soda. 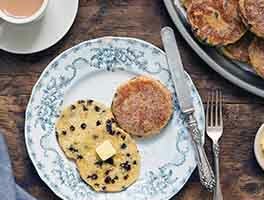 This recipe has more than double the baking soda to flour ratio of any other biscuit recipe I have tried, although I thought the Bakewell Cream might be contributing to the bitterness. The baking technique was intriguing, and the biscuits turned out looking fabulous. The second time, I added a tablespoon of sugar to offset any bitterness from the Bakewell Cream. The third time I made these biscuits, one of my children brought hers back to the kitchen saying it burned her tongue. I thought the same thing when I tried one. It's a chemical burning sensation, and the sugar doesn't cover it completely. I will try them one more time with less baking soda and/or Bakewell Cream, but I fear the resulting biscuits will not bake as high or fluffy. Others seem to love them, so maybe we are just not used to the Bakewell Cream flavor. I am a biscuit freak. I have tried many recipes but never found one that was hitting the spot. Until this one. It is THE ONE. Everyone I served these too raved about them. Great with chicken and a must for Thanksgiving. Did I mention breakfast bacon egg and cheese on a biscuit? First I'll share a funny and sleepy mistake on my first batch that came out like rocks. I decided to be accurate and weighed my flour. In my sleepy head I thought, "a cup is 8 ounces. Ok, I need 16 oz for a half batch." Needless to say, mistaking a volume measure for weight did not work out well! A pound of feathers weighs the same as a pound of bricks but... :) So take 2! My only complaint...why didn't I make a full batch?? These are the first biscuits I've ever made that are better than I could buy. By a lot! I made a couple changes: I used half butter-flavored shortening and half butter, I used cake flour for a portion of the flour to make it lighter (180 g AP flour, 50 g cake flour for a half batch) and I cut them square with a pizza cutter then pulled slightly apart to bake. Maybe they were too close together because they were still really wet in the middle at 5 minutes so I left the heat on for another 5 minutes then pulled them out of the oven. Maybe it's because I used my convection oven and it cools off faster than a normal oven. But no matter - the tops were a little crunchy, the middles tender and light. Heaven! Easy to make and delicious! Great Easter breakfast. My new go-to biscuit recipe.